Adonis amurensis, Amur adonis, Zones 4-7. 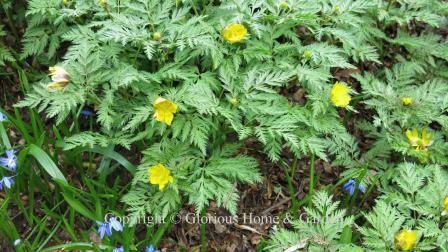 One of the first perennials to bloom in spring, adonis carpets the ground with soft, ferny foliage and bright buttercup yellow blooms brownish-red sepals. Great as a woodland ground cover. Ajuga reptans, bugle weed or carpet bugle, Zones 3-9. 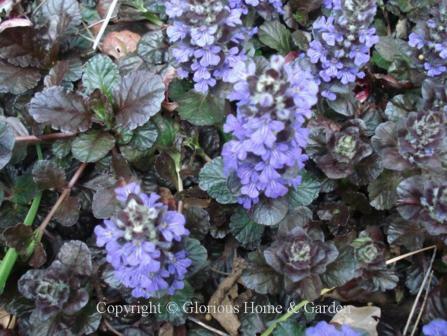 A lovely and useful ground cover, ajuga will quickly grow into a low dense mat of green and purple foliage with spikes of violet flowers in spring. Weeds have a hard time competing with the density of ajuga. It does well in partial shade, and thus is nice for underplanting shrubbery. Beware the tendency to invade lawns, however, due to its stoloniferous roots. If that occurs, it is easy enough to dig up the travelers and plant them elsewhere. There are some excellent cultivars on the market. 'Black Scallop' (pictured) has very dark burgundy, almost black foliage, 'Caitlin's Giant' sports larger leaves and taller (up to 10") flower spikes, 'Chocolate Chip' has smaller, dainty leaves, and 'Silver Beauty' has variegated green and white foliage. 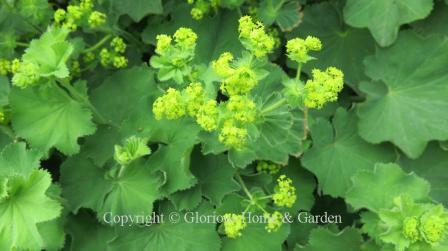 Alchemilla mollis, Lady's mantle, Zones 4-7. The soft, fuzzy, pleated leaves contrasting with sprays of yellow-green flowers make for a beautiful ground cover where they can be grown successfully. But as they prefer the cooler temperatures and moisture of more northern climes, they don't do well in my hot, often dry, 7b garden. Amsonia hubrichtii, Arkansas amsonia, Zones 6-9. I finally tried my first amsonia a couple of years ago after reading about its qualities for years, and I have been very impressed. 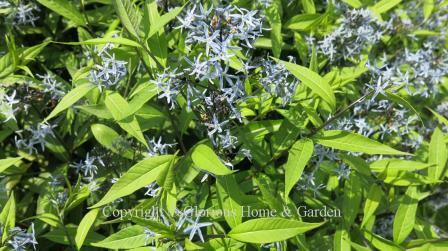 Amsonia hubrichtii is a useful filler in the garden with its soft, feathery foliage, and in spring is topped with small pale blue star-shaped flowers. My clumps have increased every year, and I love the show it puts on the autumn when the leaves turn to gold. Amsonia tabernaemontana var. silicifolia, blue star, Zones 3-9. Another American native, this species has longer, wider leaves than A. hubrichtii, but also has blue flowers in spring and golden foliage in the fall. Aquilegia canadensis, Canadian columbine, Zones 3-8. 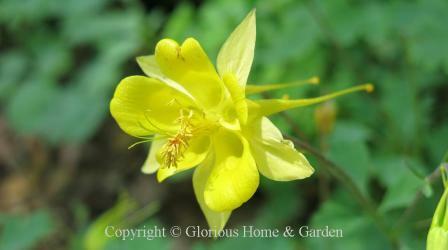 This native columbine is a lovely addition to the shady border. On their thin, wiry stems they often seem suspended in air and glow like little lanterns of red and gold. A lovely spring perennial combined in the border with others like species tulips, pheasant eye narcissus, wood hyacinths, violas and wallflowers. They will self-sow, or you can collect the ripe seeds to plant them around the garden where you will. Great hummingbird and butterfly attractant. Aquilegia chrysantha, golden columbine, Zones 4-8. 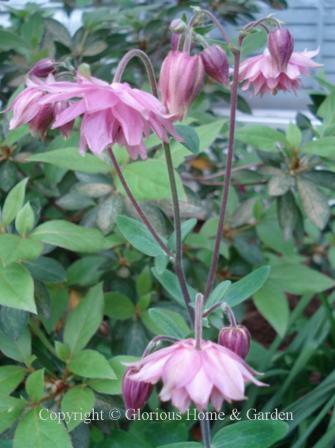 This is another North American columbine native to the southwestern U.S. and Mexico. The large bright yellow flowers are very striking in the garden. Aquilegia X hybrida, hybrid columbine, Zones 3-9. The beautiful long-spurred hybrid columbines are some of my favorites in the spring garden. Their delicate airiness blends well with other plants. It's not always easy to find them in nurseries, but they are easy to grow from seed started indoors in late winter, or directly in the garden when danger of frost is past. Then you can have plenty to place where you will in the garden. 'Mrs. Scott Elliot' is a lovely old strain with long spurs in bicolor combinations of white, yellow, rose, lavender and blue. Other strains to look for are the McKana Hybrids, Origami Hybrids and the Songbird Series. 'Origami Blue and White' is shown below. The nemesis of columbines is leaf miner which is a fly that lays its eggs on the new leaves. The emerging larvae eat tunnels through the leaves leaving ugly, unsightly tracks. If leaf miner is a problem, about the only remedy is to cut back the foliage after blooming is finished and a new spurt of growth will appear. Aquilegia vulgaris 'Clematiflora,' clematis-flowered columbine, Zones 3-8. 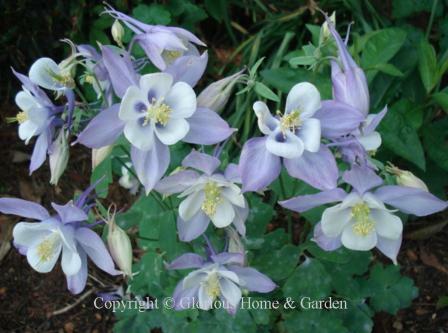 These delightful columbines have spurless nodding flowers produced over several weeks in the garden in shades of white, rose, blue and purple. Easy to grow from seed, and in fact will self-sow, so even though the individual plants are not particularly long-lived, new generations will follow. Not to be confused with the "Clementine" series which are similar, but have upright facing flowers. 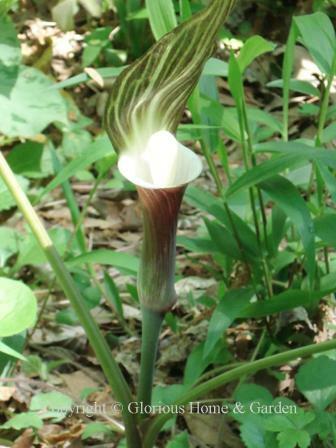 Arisaema sikokianum, gaudy Jack, Zones 5-7. A relative of our native Jack-in-the-pulpit, gaudy Jack, from Japan, has a striking white spadix surrounded by a purple striped spathe. 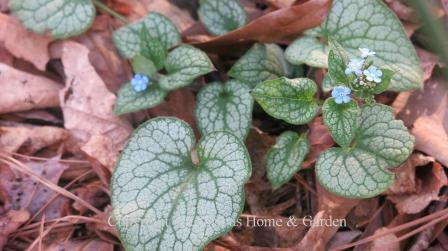 A lovely spring perennial in a woodland garden. Aruncus dioicus, goat's beard, Zones 3-7. Goat's beard, a Northeastern native which can grow to 6' tall, is a spectacular plant--if you can provide its preferred growing conditions, i.e., consistent moisture, partial shade, cooler temperatures, and room to spread. Resembling a giant astilbe, the white-to-cream blooms are airier and more pendulous than astilbe. 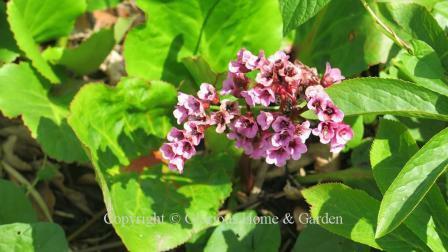 Great plant for a woodland garden or at the back of a partially shady border. Baptisia australis, false blue indigo, Zones 3-8. 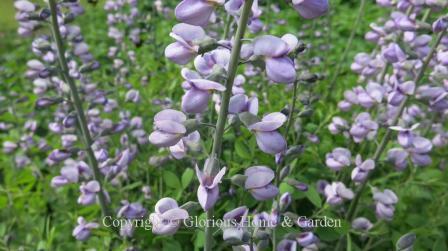 One of our native plants that is growing is popularity is baptisia, or false indigo. It seems to have an oxymoronish sort of common name given that indigo is so strongly associated with blue. Well, it is false indigo after all, though B. australis was sometimes used as a substitute for the true indigo plant, Indigofera tinctoria. 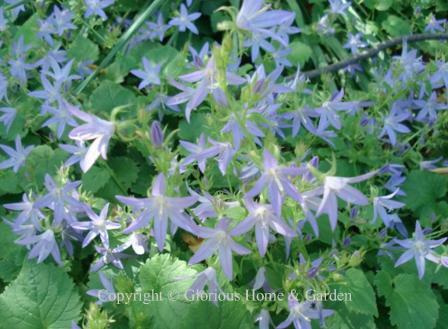 Nomenclature notwithstanding, this spring perennial forms shrubby clumps with long racemes of blue pea-like flowers. A natural cross of the white species, B. alba with B. australis produced 'Purple Smoke' shown below. Baptisia sphaerocarpa, yellow wild indigo, Zones 5-8. 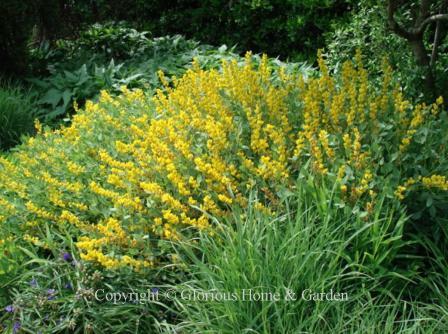 Native to the south-central United States, this yellow baptisia is an excellent garden plant as evidenced by the impressive clump at the Daniel Stowe Botanical Gardens below. Bergenia cordifolia, heart-leaf bergenia, Zones 4-8. Mostly grown for its foliage, bergenia has thick, leathery, heart-shaped leaves that make a nice ground cover for moist, shady areas. The leaves tend to turn burgundy red in winter, but are often tattered and bedraggled by the end of the season. Spring sees a short panicle of small pink to red flower arise from the center of the plant. Campanula poscharskyana, Serbian bellflower, Zones 3-8. 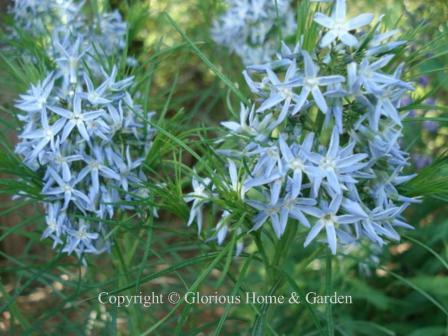 Soft, lilac-blue star-shaped flowers bloom in spring. These are good plants for difficult dry situations. Try them to edge walkways or borders, in rock gardens, or tuck some in chinks of stone walls to cascade down. Centranthus ruber, red valerian or Jupiter's beard, Zones 5-8. 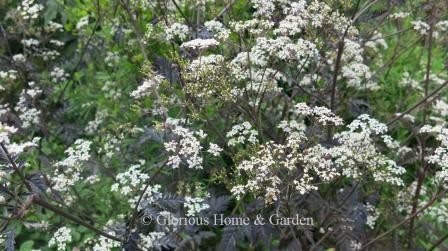 Growing from 1 1/2 to 3' high, this is a good plant for the mid-to-rear of the border. The fragrant rosy pink flowers bloom from mid-spring through most of the summer and will self-seed (thus considered invasive by some). 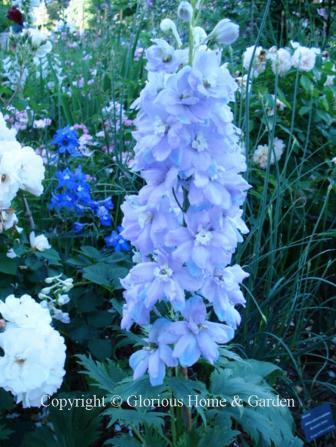 Delphinium X elatum, hybrid delphinium, Zones 2-7. Some of the most gorgeous blues in the flower world are found in delphiniums. These tall, stately plants with heavy flowerheads must be staked to prevent breakage, but nothing gives the spring border the height and elegance that the hybrid delphiniums do. Dianthus x allwoodii, Allwood pinks or Modern pinks, Zones 4-8. This series of hybrids is well-known for its fragrance from its D. plumarius parentage, long bloom time and larger flowers from its D. caryophyllus (carnation) parentage. Tufts of gray-green foliage topped with fragrant flowers in shades of white, pink, salmon and red make wonderful edging plants for beds and borders. Good drainage is a must to prevent root rot and deadheading will keep them in bloom for a longer period of time. 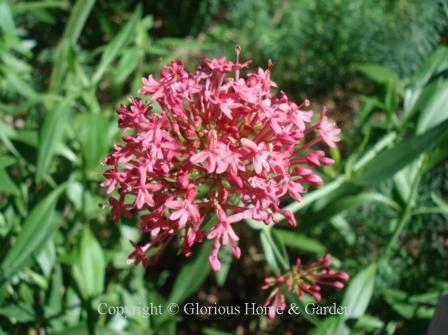 'Old Spice' (shown below) has fringed, salmon-pink flowers with a lovely clove scent. 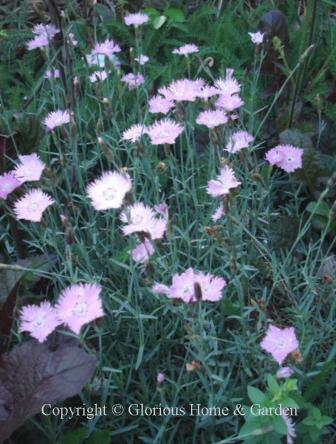 Dianthus arenarius, sand pink, Zones 3-10. Looking for something different? 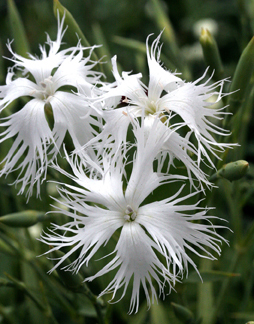 This highly fringed dianthus will be the talk of your garden! The deeply cut petals look like birds' feathers. Pure white scented flowers arise on 12" stems from mounds of blue-green foliage. Loves well-drained soil and full sun. Dianthus barbatus, sweet William, Zones 3-8. 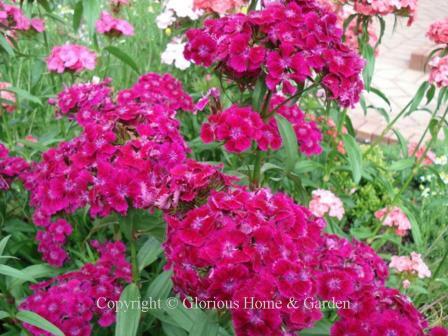 Sweet William is actually a biennial that is easy to grow from seed sown in the fall to bloom the following late spring, and will self-sow in your garden. They produce large flat-topped heads of flowers in shades of white, pink, red or combinations, but, unfortunately, lack fragrance. Dianthus gratianopolitanus, Cheddar pinks, Zones 3-8. Cheddar pinks have fine, grassy evergreen foliage that forms a neat mound. The bloom period can be extended by deadheading the spent flowers before they go to seed. They are a great spring perennial to use as a filler, or to edge a border. 'Bath's Pink,' below, has pale pink fragrant flowers and is a prolific bloomer. Other good cultivars are 'Firewitch,' with magenta flowers and repeat sporadically in the summer, and 'Tiny Rubies' will small deep pink flowers on short stems rising from and equally petite tuft of foliage. 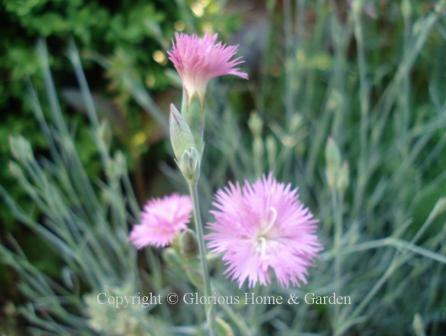 Dianthus plumarius, cottage, garden, or feather pinks, Zones 3-8. 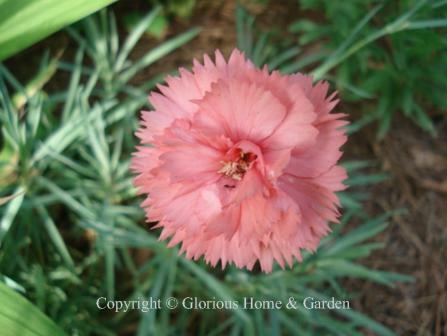 D. plumarius, a European native, is one of the parents of many of today's popular garden pinks. It, and most of its progeny, are characterized by gray-green grassy foliage, deeply cut fringed petals in the usual shades of white, pink, rose, red and combinations on 10" to 18" stems, and strong clove fragrance. 'Mountain Mist' is a hybrid with pale pink fringed flowers on blue-green foliage. 'Birmingham' is a deeply fringed double white; 'Rose de Mai' is pink with a deeper pink eye; 'Musgrave's White' has single blooms with a green eye, and 'Lady Granville' white with a deep raspberry center. Dicentra eximia, fringed bleeding heart, Zones 3-9. 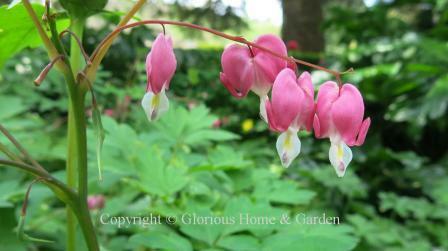 Our native bleeding heart is a lovely plant for the shade garden with its finely cut fern-like foliage and charming flowers of rose or white which are smaller than those of D. spectabilis, but produced in greater abundance and for a much longer time period. Dicentra spectabilis, bleeding heart, Zones 2-8. 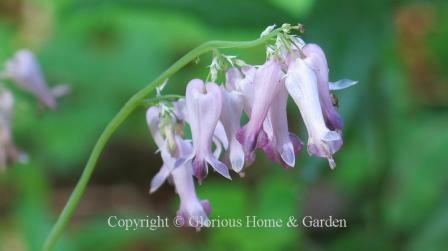 One of the most charming spring perennials for the woodland garden, the shape of this Japanese native is unique. Arching racemes of little puffed hearts of pink and white are a delight in the woodland garden and are a great companion for ferns and other spring perennials such as hostas, epimediums and trilliums. The foliage may go dormant in the summer if the plant does not get enough moisture. Dictamnus albus, gas plant or dittany, Zones 3-7. I remember reading about this plant a long time ago and being fascinated by its apparent ability to produce sparkable fumes from its roots when cut. I’ve not seen it growing in the South because it prefers cool nights to flourish. 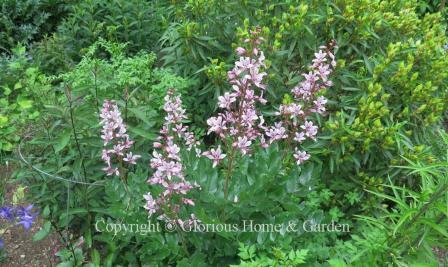 However, I did see some recently at Kiftsgate Court in the Cotswolds, and it is a beautiful plant. Fragrant pink or white flowers are held erect on stiff stems to rise to 2 to 3’. Said to be long-lived and does not like to be disturbed once established. 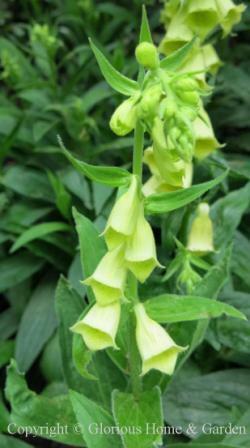 Digitalis grandiflora, yellow foxglove, Zones 4-8. The beauty of yellow foxglove is that as a true perennial it lasts longer in the border than D. purpurea, and the color gives one added flexibility in planning color schemes. Like D. purpurea, also poisonous if eaten. Digitalis purpurea, common foxglove, Zones 4-8. 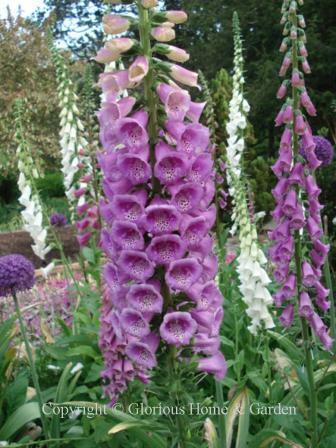 Foxgloves rival delphiniums for the "tall, stately elegance" crown in the spring-to-early summer border. Spires of white, cream, pink, rose, and purple, often with spotted throats, are very useful to provide height to the spring perennial border. Foxgloves are biennials meaning seeds that sprout one year will bloom the following year, so often we buy established plants at the nursery and treat them as annuals, though they will often re-seed in the garden. The variety 'Foxy' will bloom the first year from seed. Usually you will find mixed colors in series such as 'Foxy,' 'Shirley,' and the giant 'Excelsior' hybrids. Be aware that the leaves are poisonous and should be kept away from children and pets. The drug digitalis is derived from this plant and is used to treat heart disease. Digitalis x mertonensis, strawberry foxglove, Zones 3-8. 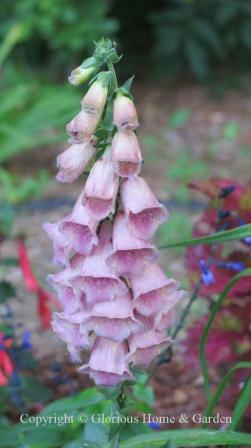 The strawberry foxglove is a hybrid between D. grandiflora and D. purpurea, and combines traits of both parents. It is longer-lasting than D. purpurea, but not as long-lived at D. grandiflora. The individual flowers are large, the soft strawberry pink coloration is unique and the rosette of leaves is attractive in the garden. Still poisonous of course.